Launched in 2012 in response to kestrel population declines across much of North America, The Peregrine Fund’s American Kestrel Partnership is a network of citizen and professional scientists working to collaboratively understand kestrel demographics and advance kestrel conservation. USGS Breeding Bird Survey data indicate that American Kestrels have been steadily declining since at least the 1960's across North America. However, scientists do not have sufficient data to understand what is causing these declines. Partners of the American Kestrel Partnership install and monitor kestrel nest boxes and contribute their findings to our centralized database as we work to understand why kestrels are declining. Most residents of the Western Hemisphere have seen American Kestrels, even if we can’t pick one out in a birding book. In fact, kestrels have long been appreciated as North America’s most abundant bird of prey: they watch us from ledges as we stop into a city café, or from power lines as we stroll along country highways. They also cram a lot of attitude into about four ounces of bird. Most people familiar with kestrels cannot resist hitting the brakes for a better view when they spot one hovering in midair, waiting for a mouse to make the wrong move. You can read more about their biology here. Unfortunately, this historically common little falcon has become a rare sight in many regions of North America, where populations have been declining for decades. In several areas the declines are relatively steep, such as the Bird Conservation Regions for the Southern Rocky Mountains/Colorado Plateau, Lower Great Lakes/St. Lawrence Plain, and New England/Mid-Atlantic, illustrated in the graph above and based on roadside count data from the USGS Breeding Bird Survey. Reasons for population declines that have been suggested include land use, climate change, depredation by Cooper’s Hawks and other birds of prey, competition with European Starlings for nesting cavities, and environmental contaminants such as rodenticides, heavy metals, and brominated flame retardants (used in electronics and textiles). However, there has been no scientifically rigorous evidence to support any of these hypotheses. In reality, researchers do not have sufficient data to understand why these long-term, wide-spread population declines are occurring. Counts like the Breeding Bird Survey indicate there are fewer breeding kestrels, but they cannot determine where the birds are having trouble in their life cycle. Are adults not returning after winter to breed? Are they dying at high rates during breeding, migration, or over-wintering? Are they not breeding as often or failing when they do try to breed? And, critically, how are these demographic processes influenced by land use, environmental contaminants, climate trends, and competing or predatory species? These questions highlight the need for nest box monitoring data, which offer demographic insights beyond head counts by giving us a glimpse into the kestrel life cycle. Although there are many successful nest box programs across North America, they are largely localized and isolated from each other—making it difficult to draw reliable conclusions on a large scale. In response, the American Kestrel Partnership coordinates a network of professional and citizen scientists who monitor nest boxes and contribute their data to a single database. With information collected in a similar manner from across the range, we can start to identify trends we hope leads to greater understanding of what may be causing declines. Do you see kestrels where you live? Whether your local environment has growing, stable, or declining kestrel populations, we need your observations to advance kestrel demographics and conservation. To learn more about kestrel population trends in your state or Bird Conservation Region, please visit our webpage on population declines. Become a partner: Anyone can be a partner, whether you are simply curious about kestrels, work as a professional researcher, already maintain or want to develop a nest box program. Registered partners will receive our quarterly newsletters and announcements, have access to all partnership documents, and are able to enter nest box monitoring data. To directly participate in the research process, you can build or buy, install, and monitor one or more kestrel nest boxes, and then enter the information you collected into the American Kestrel Partnership database. 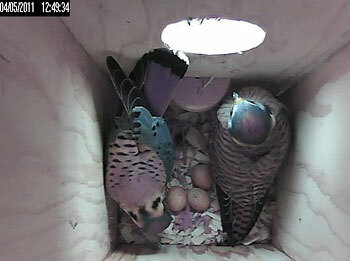 Nest box monitoring is simple and does not require professional research skills, so citizen scientists can make critical contributions to kestrel research and conservation. Your data are critical for researchers to understand and address kestrel population declines. Managing a kestrel nest box program is a fun, easy, and rewarding experience, and in doing so, you can contribute to the largest American Kestrel research and conservation initiative in history. If you monitor boxes and have proper permits to sample kestrels, you may be able to contribute to the American Kestrel Genoscape Project, which you can read about here. If you cannot monitor your own box, you can Adopt-A-Box to receive updates on a box we monitor while you support one of the longest running monitoring programs in the Americas. Each adopted box comes with a one-year membership to The Peregrine Fund and is a great gift for the conservation-minded loved ones in your life. Visit our research goals page to learn about exciting research underway. Tune-in to our KestrelCam each breeding season and log what you see! Follow us on Facebook and Twitter for weekly interactions. Donate to support our efforts! Donations of $25 or more per year comes with a one-year membership to The Peregrine Fund.